Product weight is 1.9 lbs. 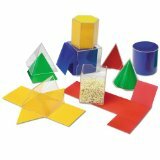 Innovative folding geometric shape set is perfect for hands-on lessons in symmetry, perimeter, area, surface area and volume Unique 3D form brings concepts to life Each shape features a hang tab and sturdy cardboard base (except sphere) For children between 7 to 12 years Transparent geometric shapes plus corresponding fold-up net inserts include cylinder, square pyramid, cube, rectangular prism, cone, hexagonal prism, triangular pyramid and triangular prism. Includes 16 total pieces (8 transparent and 8 folding shapes). Measure 3"H. 16 Pieces. I teach 7-8 grade math and love these foldable geometric shapes. My students quickly grasp the concept of a "net" and how to find the surface area of a polyedron. They also are perfect for demonstrating the relationship between the volume of a prism and a pyramid with the same base area and height. I show them that scooping up 3 pyramid fulls of beads can fill up the corresponding prism, hence V = BH/3.However, I recommend buying the EAI Educat..